Peter Brannan was born in Cleethorpes, Lincolnshire in 1926. Inspired by his artistic father and brother, he began to show talent at an early age, studying at Grimsby School of Art and then the Leicester College of Art. He was elected RBA in 1960 (the year of his first exhibition in London) and was made President of Lincolnshire and South Humberside Artists. Brannan showed a great admiration for the work of the French Post-Impressionists and also the still-lifes of Chardin. Yet the Lincolnshire landscape held equal appeal as a source of inspiration and throughout his 30 years in Newark Brannan produced numerous paintings of the market town and its people. 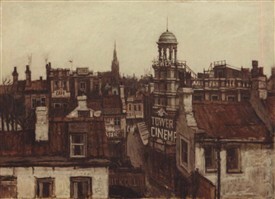 As art critic Eric Newton observed, “it is evident that Newark is as stimulating to him as Montmartre was to Utrillo.” Brannan has had his work exhibited at the Royal Academy and the English Art Club. Peter lived and worked in Newark from 1951 until the early 1970s, retiring as Head of Art at the Magnus School in 1981. He had previously been Head of Art at Lilley & Stone Girls’ High School and a former art master at the Mount School. His main subjects were buildings, beach scenes, flora and porcelain. He lived in Mount Lane, Newark. 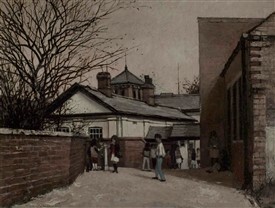 Some of his paintings can be seen at the Usher Art Gallery, Newark, and the Newark Town Hall Art Gallery has a selection on permanent display. The NSDC Museum Resource Centre also holds some. During his thirty years in Newark, he left a wonderful legacy of interesting paintings, most of which are now in private hands. Illustrated here ’A View of a Town’, is illustrative of Peter’s distinctive style – somber in tone, a restrictive range of colours – never using blue. 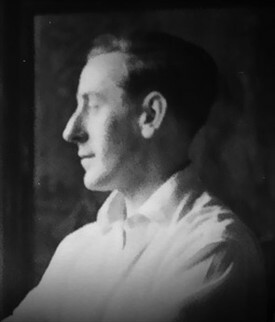 Peter died in 1994 and is buried at Welbourn, Lincolnshire. Peter Brannan was chosen as one of Newark’s artists, commemorated on one of a series of six art banners that are on show around the town. The aim of the project was to promote art in Newark, which has a unique number of artists, both past and present, who have achieved national fame. For such a modest market town, we seem to bring out the best in artistic talent! I read your article on Peter Brannan and decided to write. I found a painting in a resale shop in the Chicago, Illinois area. On the back was a strip of paper that stated the title of the painting was “The Old Mill House” and “attributed to Peter Brannan”. The painting seems to be unsigned. Some further biographical information is listed on the paper, including the fact that this painting was reframed, and was once in a frame with an inscription stating the painting was attributed to Mr. Brannan. Can anyone provide additional information about the history of this painting? Thank you! To sryan I would be interested to see a picture of this painting, if you have one? Can you describe it a bit more? I have consulted with the Town Hall Museum here in Newark, and we think it certainly sounds like one of Peter's works, though have no knowledge of this particular one.